The Man from Snowy River is one of the most famous - if not themost famous - Australian poems of all time. It was written by Banjo Paterson and first published in The Bulletin, an Australian news magazine, on 26th April 1890. Paterson set the ride described in the poem in the area around what is now Burrinjuck Dam, north-west of Canberra. Apparently Paterson helped round up brumbies there as a child and later owned property in this region so he knew the country well. Who Was The Real 'Man From Snowy River'? 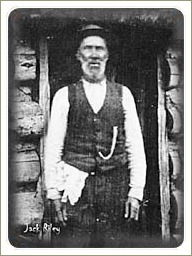 A small town called Corryong claims a stockman named Jack Riley (1841–1914) as the inspiration for the character. Jack Riley (that's him on the left) was a hermit stockman who worked for John Pearce of Greg Greg Station at Corryong. He was employed to run cattle at a remote place called 'Tom Groggin', 60 kilometres upriver from Khancoban in New South Wales. Corryong legend has it that Paterson met Riley on at least two occasions, although there isn't any real evidence to support this. A man called Charlie McKeahnie is the second possibility. Charlie was only 17 years old but was already known as an exceptional and fearless rider when he performed a dangerous riding feat in the Snowy River region. The story goes that another bush poet, Barcroft Boake, wrote an earlier poem called On the Range which tells the tale of Charlie's chase after a wild brumby stallion. Apparently Paterson was in the crowd on one occasion when the story was told. There is also said to be a letter written by McKeahnie's sister in which she discusses the ride and Paterson's knowledge of it. McKeahnie was killed in a riding accident near Bredbo in 1895. 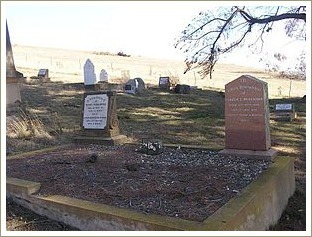 He's buried in the Old Adaminaby cemetery, on the shores of Lake Eucumbene. I guess we'll never know for sure which man inspired Paterson to write The Man from Snowy River but writers will tell you that their characters are usually a mixture of various people they've met over the years. Perhaps the truth is that Paterson did meet and talk with both Riley and McKeahnie and that he used both their stories to create his own Man from Snowy River.